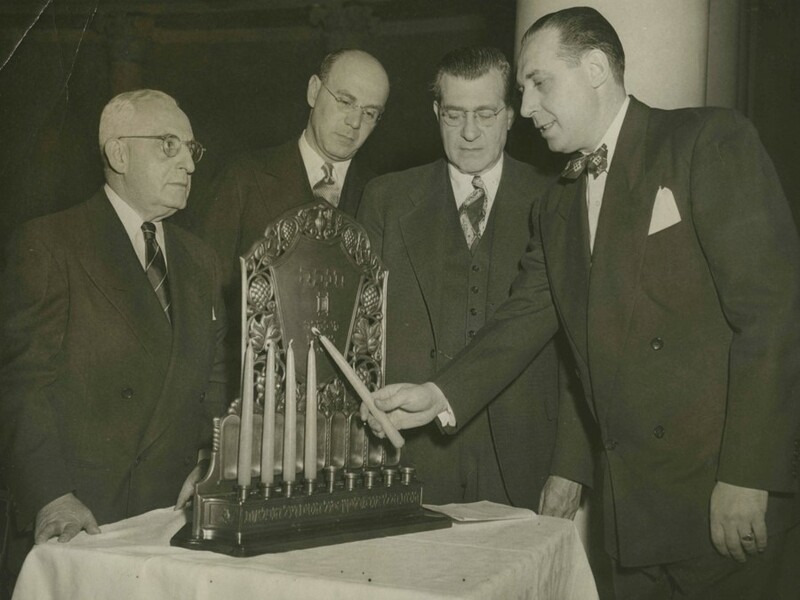 The Jewish holiday of Hanukkah is here, and the Rauh Jewish History Program & Archives of the Heinz History Center has prepared eight days of treats from the archives. On the evening of Sunday, Dec. 6, the Jewish holiday of Hanukkah, meaning dedication, began. 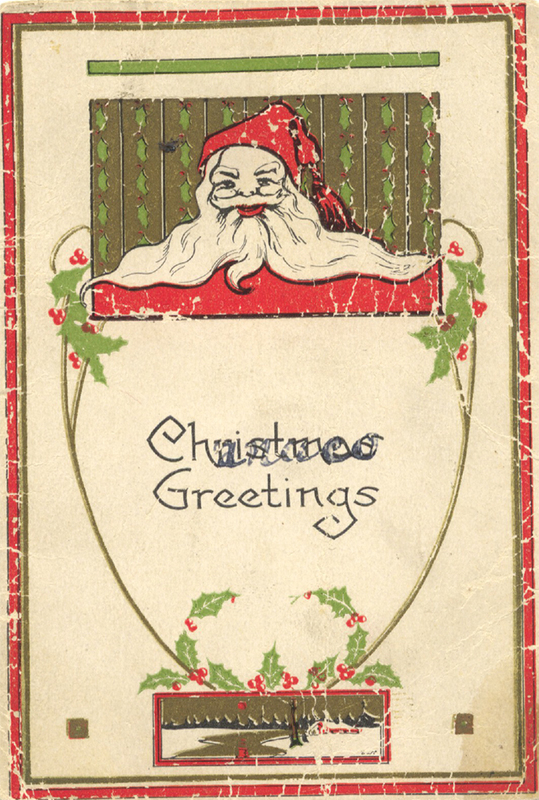 Here are some of our favorite Hanukkah artifacts and stories from the History Center’s Rauh Jewish History Program & Archives, some for each of the holiday’s eight days. First things first: What is Hanukkah? 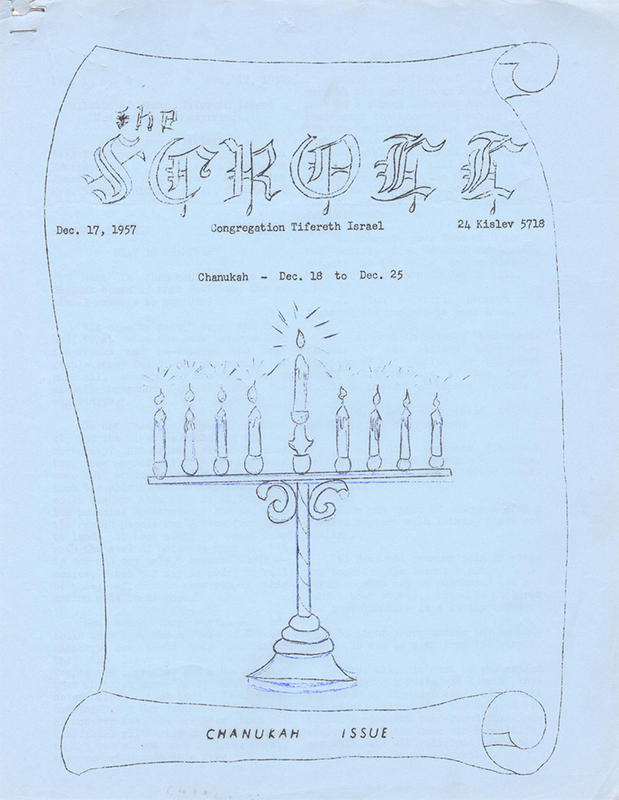 New Castle’s Congregation Tifereth Israel offered a primer of its own in its 1957 Hanukkah newsletter. 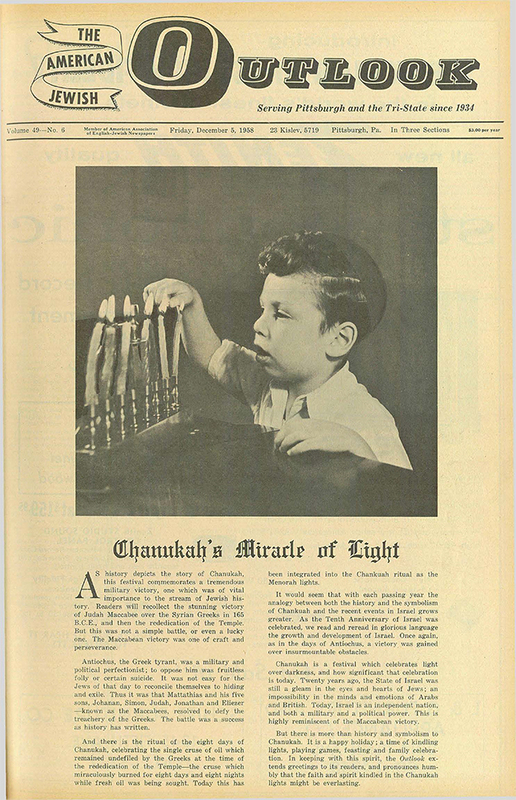 <a href="http://www.jewishfamilieshistory.org/document/scroll-chanukah-issue/">Read the entire Hanukkah primer</a>. 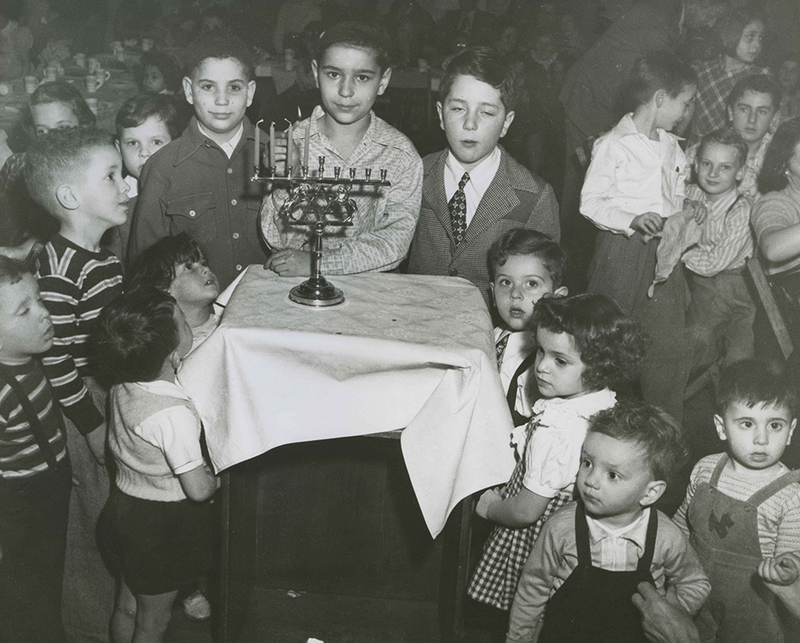 A children’s Hanukkah celebration sponsored by the Friendship Club, c. 1950. Earnest Nachman Photographs, Rauh Jewish History Program & Archives at the Heinz History Center. During the Nazi rise to power in the 1930s, Pittsburgh Jews mobilized to raise money to aid refugees, some of whom were brought to Pittsburgh and supported by the Jewish community. The Friendship Club was founded in 1936 by German-Jewish refugees as a support group which welcomed those who continued to arrive. Events like this Hanukkah celebration helped these refugees ease into American life following their liberation from Nazi rule. 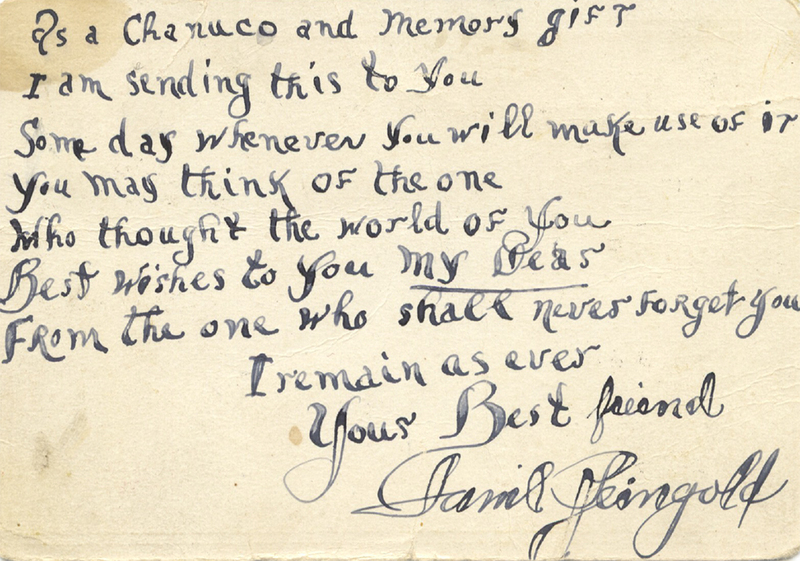 “Chanuco Greetings,” wrote Samuel Reingold to his friend Anna Spiegle. The two later married. Two congregations from very different religious movements – Temple Sinai from the liberal Reform movement, Bnai Emunoh from the ultra-orthodox Chabad Lubavitch – still share the same Hanukkah candle lighting ritual. Both congregations remain important parts of Pittsburgh’s diverse Jewish community. Below, two synagogues separated by time and religious movements engage in the same ritual of lighting the menorah. This spinning top game is played by Jews the world over during Hanukkah. It is common enough that a local savings & loan designed an ad around the game in a Dec. 1958 American Jewish Outlook. 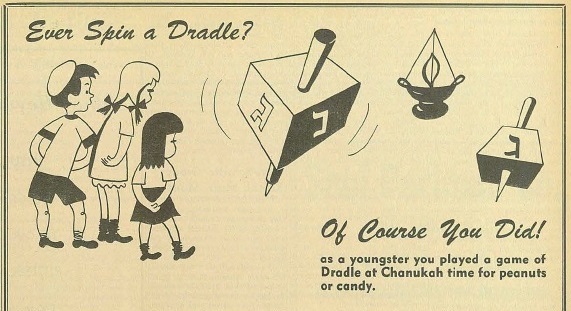 Never spun a dreidel? Learn to play! 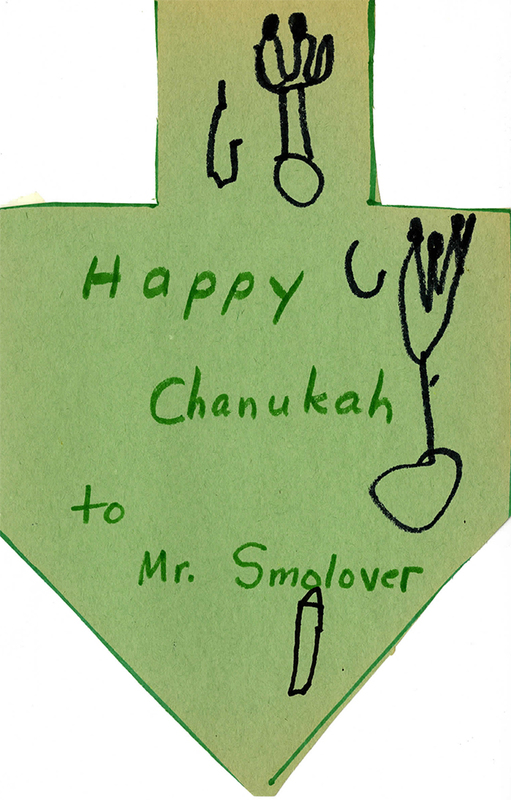 The dreidel even lent its distinctive shape to Hanukkah cards made by local Jewish day school students in 1981. <a href="http://www.jewishfamilieshistory.org/document/dreidel">Learn more</a>. 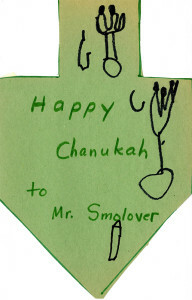 Hanukkah 1980. Beth Israel, Sharon Collection, Rauh Jewish History Program & Archives at the Heinz History Center. A great miracle may have happened there, in ancient Israel, but a great magic show happened here, in Sharon, Pa. 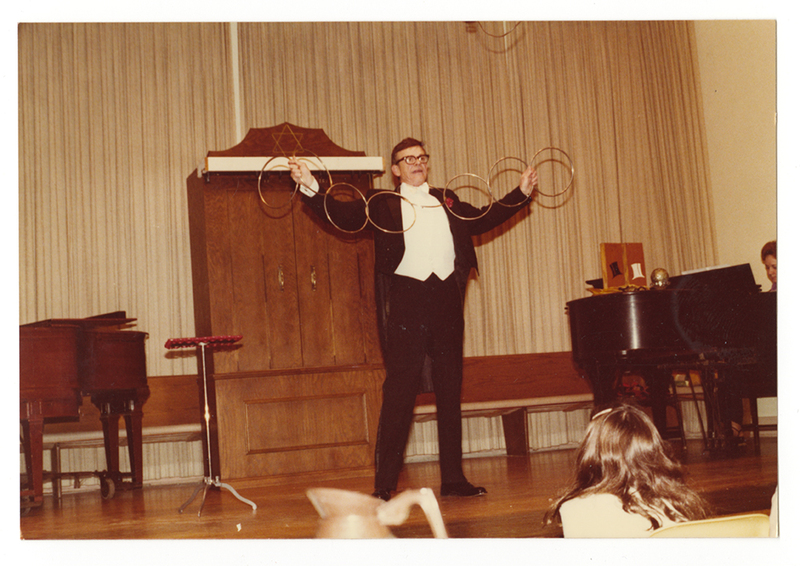 In 1980, Temple Beth Israel featured a magician at its annual Hanukkah Dinner. Latkes (potato pancakes) and gelt (chocolate coins) are evidently not the only way to celebrate the holiday! 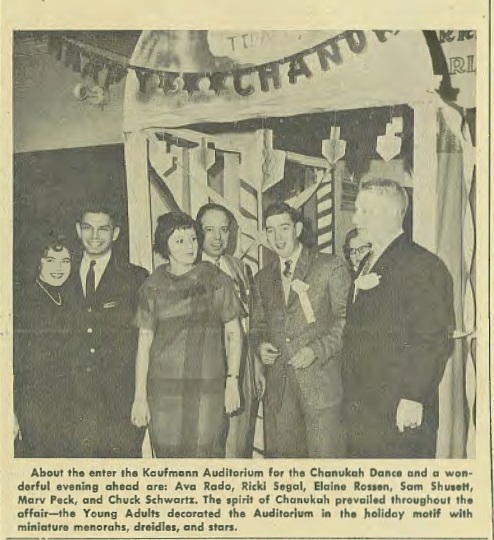 In 1958, the Kaufmann Auditorium of the Irene Kaufmann Settlement, located in the heart of the Hill District, played host to Pittsburgh’s Young Men & Young Women’s Hebrew Association (YMWHA) Chanukah Dance. 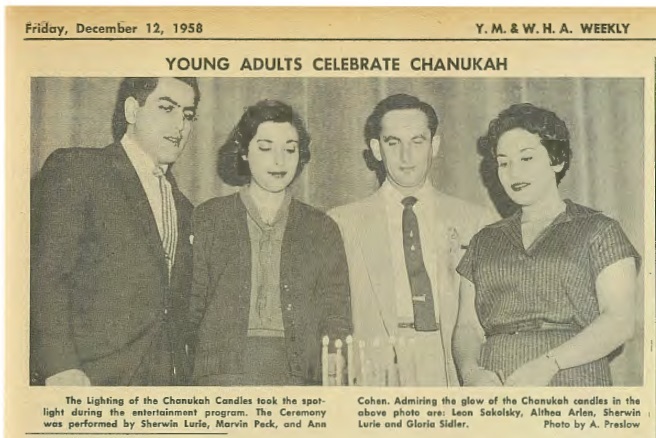 This was the last year the YMWHA Chanukah Dance was held on Centre Ave. In 1959, the Irene Kaufmann Building of the JCC opened at 5738 Forbes Ave. in Squirrel Hill. The entertainment portion of the evening included a candle lighting ceremony and a performance from the Young Judean Dance Group. Y.M. & Y.W.H.A. Weekly, Dec. 12, 1958. 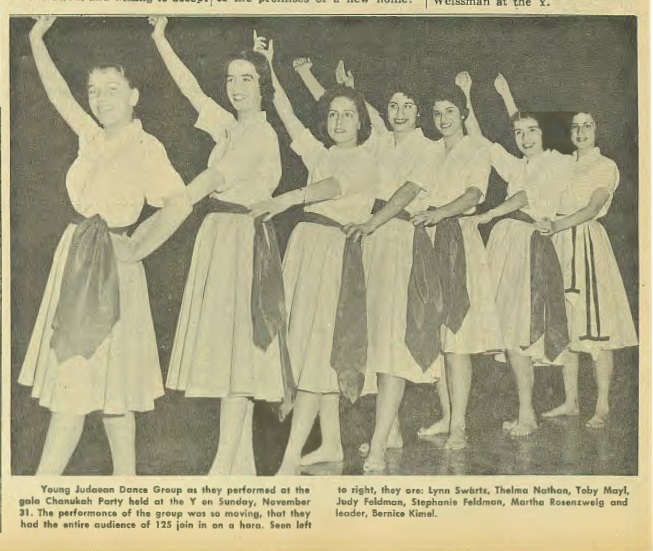 <em>Images courtesy of Carnegie Mellon University’s <a href="http://digitalcollections.library.cmu.edu/portal/collections/pjn/index.jsp">Pittsburgh Jewish Newspaper Project</a></em>. 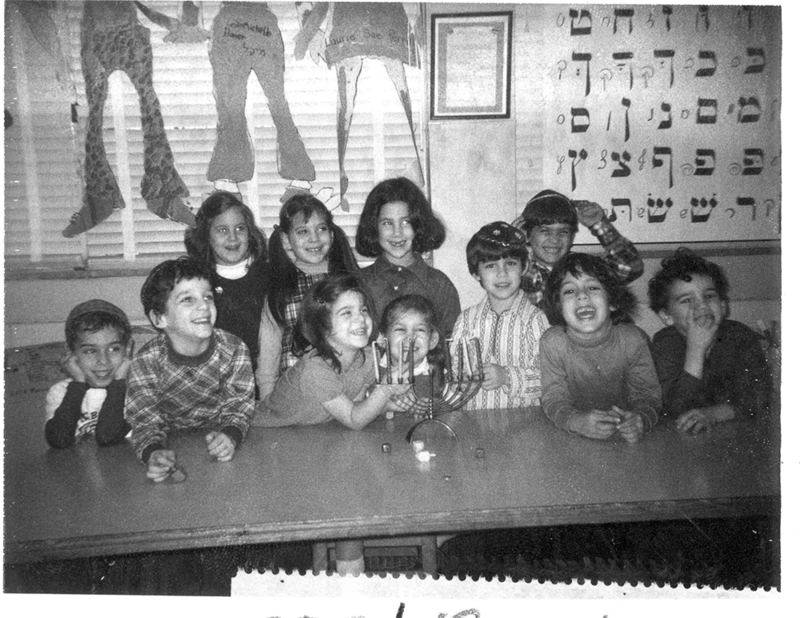 Community Day School celebrates Hanukkah, c. 1985. United Jewish Federation Photographs, Rauh Jewish History Program & Archives at the Heinz History Center. Community Day School is an independent day school where students come from a range of different Jewish backgrounds. There are nearly as many ways to observe the holiday of Hanukkah as there are people that celebrate it! What are some of your Hanukkah traditions? 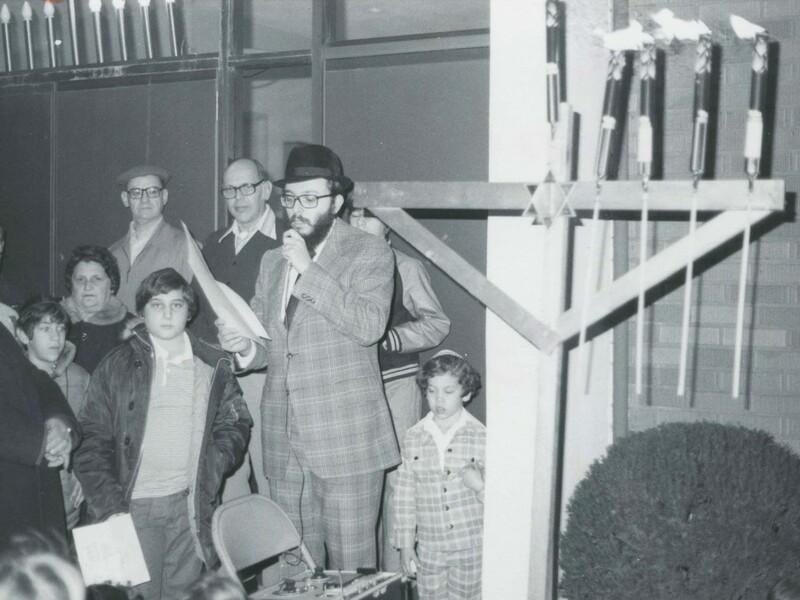 Share your Hanukkah memories and artifacts with the Rauh Jewish History Program & Archives! Email the director of the Jewish History Program with your questions, comments, reminiscences, and offers of artifacts and records at dmschlitt@heinzhistorycenter.org.